The Garabandal Warning Year/Confirmation ? According to my latest research and since my return from Garabandal this summer, after checking 2 important and significant détails unsure to me yet, it is with confidence and a certain Joy that I can publish today and online, what I believe to be finally the right year of the Garabandal Warning as the Year 2018, giving this year online and publicly, I therefore take full responsability while maintaining the will of Heaven, who chose his main seer to announce the Great Miracle date 8 days before only. I suggest to all of you to keep this Year with you from me as before the Year 2018, many difficult events will take place, thank you. I will explain why the Year 2018 could be the Warning year this week, thank you to be patient, you might be surprised. Many comments about this Article written last october, private and public, some keep reminding me, even close friends, speculate on the dates of the Garabandal Prophecies is not good, not the wish of Heaven and so on, below some of your questions and my answers ? Many are talking about the Year 2017, so you are probably wrong ? why not but this is not my opinion, Nothing related to the Garabandal prophecies will happen in 2016 as in 2017, as you can see, I really insists, thank you. https://garabandalnews.org/2016/01/01/garabandal-prophecies-by-aviso/ This article have password i can-tread it. why? warnig I thinkyour thinking are Ok 101 time cried at Akita, 2018 101 year of fatima aparitions. podria darnos algun dato estra profavor para tener mas discernimiento. thanks *its dificult to me write this ideas in English sorry? hola Luisa, the article you are talking has no password, try again. I would like to reach you on email. I am Catholic, and the whole of 2016 has been a very different, interesting and blessed year. I have had a few revelations – please email on address is….. I would like to get some advise before I share with people – perhaps you can help me share. Thank you and God Bless you and your family. PS: I found your blog while looking for definition of my experiences, which seem to relate to this topic. Hi Kanini, I will contact you, please do not leave your email online, thanks. Remember what Padre Pio said in a letter to the Garabandal seers which said they will believe in you seeing Mary, but for many, it will be too late. Does that mean something big coming beforehand, or it could mean from the time of Mary’s Garabandal appearance, to the Warning, many will have passed away which has happened. The important thing is to amend our lives right now, and be kind to those that persecute us, in word and deed. The greatest commandment Jesus told us was to love our neighbour and to pray for those that persecute us. We will be judged on how much we have loved. We all need to improve. I feel more and more that the Warning and Miracle are not too far away. I believe March 18 2018 for the Warning and April 2018 for the Miracle. Sorry. It is wrong to speculate. The late Maria Esperanza, Betania fame, great acquaintance of Padre Pio, said before 2020, significant events will occur. We must pray and fast, (offering up mortifications ) for peace, that poverty will end, and preparation for our mini judgement with God. God is Merciful, but It will be terrible, much worse than the big earthquake(7.8 m) which we have experienced recently here in New Zealand. We weren’t at the epicentre of the quake, but still our house rocked and swayed like being in a boat. I had a feeling come over me a few months before this quake about our house shaking. No damage whatsoever. Thank you Jesus and Mary. I am sure my late Australian army husband ,Paul ,who we lost tragically in a truck accident in 2007 was protecting us (he worked with Mother Teresa). God has been merciful as had the quake occurred during the day, many lives could have been lost (however, 2 people lost their lives in this quake – the land moved in places 11 metres horizonically and a couple of metres vertically) as it is the main tourist route East of Christchurch, to Kaikoura, where the whales and seals frolic. A freight train had just entered a tunnel, and two mighty slips came in front of and back of freight train. The tunnel saved the driver. What timing, ah. You state it is wrong to speculate, yet you did just that! The secret was bestowed on the visionary and not you, you have no scientific ability to second guess the Lord. We must all repent and pray that we may bring lost souls back to Jesus. That the billions of aborted baby mothers repent and that this act against creation ceases. Dear Sheila, I’m Teresa from the USA. I just started reading about the Garabandal visions of our Blessed Mother. What a wonderful experience! I just keep reading and reading. I never or perhaps don’t recall that it even happened. It gives me chills….good chills! God Bless You. 2017 is the Warning year 2018 is the Miracle year. I confirm with confidence. A new modern “seer” ? do not try to copy Aviso as you will not success, I confirm with confidence as well. But like you Aviso anyone can guess without any supporting evidence. Dates will be always speculative, so you are right, hopefuly mine will be the good one as I don’t want to join the long tail of all these incompetent donors of dates who never had any connection with Garabandal as probably yourself, as I said online several times, I can recognize a true garabandalist within few seconds, thanks again. I confirm the Year with confidence Jed. Aviso, I am afraid that Amalia knows nothing about the warning. I doubt that she was Loli’s closest sister. She was not with her in her last days. Sari was there and she had spent quite a long time with Loli when Sari’s husband was sailing, None of them know anything about the year, and it seems the only information they have is her belief in a world warning. Loli said that she had had a pernonal warning, as many people report to have had around the world. I congratulate you for your interesting blog. Hi Juan, Loli was close to all her sisters, due to some privacy I will not add anything about the Warning and I already said that Amalia as Sary do not know anithing about the Warning timing, I am close to Amalia but not to her only, thank you for your congratulation. It has finally dawned on me that the Popes visit to Fatima in May 2017 is not only the Fatima 100th anniversary but the beginning of the Fatima Chastisement from heaven. This is the same chastisement as the Garabandal chastisement. So the Garabandal warning and miracle must be before May 2017. NEXT insight ? What was the LAST insight? Aviso I wish you would be more open about your reasons for concluding 2018 is the year. I have read all your work but it just avoids this issue. Promoting discussion is not a valid basis for assertions. I do think that the Warning and Miracle are to happen soon considering of what is happening around us and speculating on the dates of when it’s going to happen makes us prepare to be in the state of Grace all the time, just like” the thief in the night” when it will come anytime. Things will happen and it will get worse since the Warning is to happen when things are at is worst. Going to Confession as frequently as we can and visit the Blessed Sacrament as often are some of the things we can do to prepare ourselves. THE WARNING COULD HAPPEN AFTER THE ANNOUNCEMENT OF THE MIRACLE AND BEFORE THE MIRACLE ITSELF. Please focus on what the meaning of the Warning is about, not when it will occur, we are sinners and Must Repent with Word and Deed. Love Thy Neighbour means the least in Society, the drunks, drug addicts and socially unacceptable! When we replace arrogance with Love we defeat Pride, Grandeur, Superiority and God graces fall upon us. Let’s all pray, that we truly repent for all sin and are pleasing to God all of the time. Spread God love and use our gift of speech to honour Christ and all the Holy Family. Hi Aviso. Thank you for the update and all the time and effort you have put into researching the events at Garabandal. With total respect to the other readers, I do not think that it is wrong or sinful for you to publish your opinion on the date of the miracle. In fact, I believe this is exactly what we are supposed to do. I say this because of what the Madonna said on June 18, 1965, “Since my message of October 18 has not been made known to the world ……..Think of the Passion of Jesus.” Why would our Mother make this statement if she didn’t want us to talk about and get the message to the whole world? Perhaps all these apparitions throughout the years were meant to leave little clues or puzzle pieces that God intends for us to put together. And why would Conchita herself leave clues if she did not want us to speculate? The more I study some of the apparitions, the more points of congruency seem to pop out. I do not see speculating on the miracle as a negative or scary thing. In fact, I am very positive about these heavenly events. Jesus taught us that God is a loving Father but also a just Father. And like a caring, loving parent with a disrespectful child, God has to make things right. He cannot overlook the mess this world is in. But God loves us so much that He wants to give us a chance to amend our ways. To me the warning and miracle are God’s ways to help us change our world for the better. If not then there may be a chastisement. So God is giving us a chance to finally come back to Him and serve Him and follow His Will. In my opinion by speculating on the date we at least are making the effort to help to get the message out to more and more people. So I hope you continue with your research Aviso. I look forward with anticipation to your next insight. Thanks Dom, my next insight online soon, stay tuned. The date of the Warning is set in Heaven and known By Conchita alone, who under instruction by the Blessed Mother will make the date known to the world eight days ahead of time. Therefore, all other predictions are speculative. Whilst everyone is entitled to their own private opinion there is a great danger to souls should any of those opinions be promoted on-line as even vaguely credible and acceptable to the faithful. Besides undermining Conchita’s role in the Garabandal events. Consider for a moment what would happen if a person in serious sin reading your blog delayed an intended return to the sacraments and died in the meantime? The implications are really that serious. That is why Bishop Del Val Gallo instructed promoters of Garabandal to concern themselves with Holy Virgins Messages and leave the supernatural aspects to the Church. Conchita herself has said: It’s not even necessary to believe in the supernatural aspect but accept the Messages from the Mother of God and amend their lives accordingly. Given the state of the world right now the promotion of those Messages above all else is more urgent than ever. Hi John, thanks for your comment as for the reminder, in my opinion Catholics are not stupid as any Garabandal faithful, probably most are aware that my opinion about the Warning year must be speculative only. Conchita has nothing to do with the Warning but with the Great Miracle only, this is a basic fact known by any Garabandalist with a minimum of knowledge and since years. The Garabandal messages are promoted on the home page of my blog, if a person is in a serious sin and read my blog, I will suggest to this person to reread your comment that’s why I am keeping it online only. The Garabandal messages target mainly the Church, many Priests, many Bishops and many Cardinals are on the road to Perdition and are taking many souls with them, this strong message from our Lady will not have any impact without its prophecies, take out the Prophecies and Garabandal would disappear for ever as its messages. As the Warning should happen before the Great Miracle, Conchita’s role is de facto undermining not by Aviso’s speculation but by facts, after the Warning day 99% of any Garabandalist and with a minimum of knowledge will probably be able to give the good Great Miracle date, which can only mitigate my own prediction which in my opinion will already be forgotten next week if not before the next week end, that should be enough to calm your concerns unless these concerns are perhaps related to a possibility that I could be right, rest assured, it would be surprising, I think to have enough experience to know what I am doing, thanks again. My oversight – you are of course correct, Conchita is to announce the date of the Miracle 8 days ahead of time – not the Warning. My apologies to you and your readers. Given the importance of the Messages – they are less prominent (in my opinion) and not readily obvious to any visitor to your blog. I accept and support that as owner of the site you should prioritize them as you see fit. The Garabandal Messages are meant for the conversion of the world, not only the clergy. My understanding is the same as that of Pope John Paul II in his letter to Albrecht Webber: “May the Message of the Mother of God find an entrance into hearts before it is too late…” Recall too that the instruction to the children by the Mother of God was to make Her Messages known to the World. I don’t think that after the Warning any Garabandalist who survives it will be in a position to know the date of the Miracle at all. If, as you suggest, that is the case, then why would there be need for any advance notice from Conchita? This question is answered by reference to the Everson Documentary wherein the months of the Miracle are given as between February – June and the Miracle date as between the 8 -16th of the month. In this situation I don’t think it’s wise to set anything in concrete. Speculation about the Miracle occurring in April arose out of an interview with a Father Morales and published in ‘The Vigil’ by US Garabandal promoter Maria Saraco. While interesting, [I have an original copy of the magazine] I’ve always had reservations about the accuracy of that prediction. My current position is consistent with the question I asked in the preceding paragraph and satisfactory to me. As the only Visionary to whom the year of the Warning was made known is now deceased – future speculations are meaningless – at least in my opinion. Aviso : I can’t force readers to click on the link of the Garabandal Messages, most are adults, the Messages are on the home page, I can’t do more. The Garabandal Messages are meant for the conversion of the world, not only the clergy. Recall too that the instruction to the children by the Mother of God was to make Her Messages known to the World. I don’t think that after the Warning any Garabandalist who survives it will be in a position to know the date of the Miracle at all. If, as you suggest, that is the case, then why would there be need for any advance notice from Conchita? This question is answered by reference to the Everson Documentary wherein the months of the Miracle are given as between February – June and the Miracle date as between the 8 -16th of the month. In this situation I don’t think it’s wise to set anything in concrete. Speculation about the Miracle occurring in April arose out of an interview with a Father Morales and published in ‘The Vigil’ by US Garabandal promoter Maria Saraco. While interesting, [I have an original copy of the magazine] I’ve always had reservations about the accuracy of that prediction. My current position is consistent with the question I asked in the preceding paragraph and satisfactory to me. Aviso : Loli who knew the Year of Warning and was not banned to reveal the Year in question, this is a fact as well and confirmed to me by her own family to whom I am very close myself but Loli did not felt ready to reveal it, I may know the possible reason but will not give more details, thank you. Be more humble John…. You come across a bit too domineering in your opinions .., it’s just an observation. That’s all. Promote that messages and leave all the spiritualism aside, concentrate on The Word of God and all else will be ok. Speculating won’t bring you closer to God but further away. Your a good man just misguided and over zealous. Our Lady tells us to Pray, Pray Pray from the heart! Interesting information regarding your belief that 2018 could be the year of the warning. There are two reasons why I believe 2016 could be the year. The first is the proclamation of the year of mercy by Pope Francis (12/8/15-11/20/16). Since the Great Warning is an act of mercy by God it would make sense for it to occur during the year of mercy. The other reason is the Pope’s letter allowing priests to give absolution to those involved in the sin of abortion during this year of mercy. I did not know that only Bishops could give absolution for this sin. It just seems after the warning there’s going to be more people seeking confession than the Bishops can handle. I would like to hear any comment you may have to this. To Anonymous, no Warning in 2016, I was in Garabandal in February and spent hours with the closest sister of Mari Loli, Amalia and her husband, both are part of my own family, they love my children like their own children, if a Warning was on the way for this year, please be sure that I would be aware myself, thanks. By the way, I should be back in Garabandal soon. Our Blessed Lady entrusted the young visionary with “The Secret” she did not allow it to be made public, I believe speculating on the date is totally disrespectful of Our Blessed Lady and the Will of God. All you need to know is this “Vsit Jesus in the Tabernackle daily” No Man or Woman on this Earth can second guess God! It is totally arrogant of anybody to try. Noel Healy from Ireland the land of Saints and Scholars Fr Malachi was a Kerryman from Ireland ! I agree that we should not guess the date or time..Howevef I can understand how the forthcoming events as predicted do worry and maybe frighten some people especially for their loved ones..such as where they will be when the chastisement comes ..The messages we have had throughout history are all very similar and that is to be ready for when that time comes.. and to try to be as perfect as we can ..to be loving towards our enemies and our neighbour ..loving God with all our heart, soul, body and mind..in that way Jesus’s requests for us to be pur, his massages, promises and prophecies will be fulfilled..We are living in extremely difficult times surrounded by the influences of pure evil which the good want to see an end to..so that peace and love will prevail…only God ..Jesus and Mary know what this world needs to make that happen ..but we we can surely figure out for ourselves that it will take something huge.and out of this world before the human race realises we are here for God and because of God..and therefore here for one another.as their temple ..for wisdo, sanctuary and for.peace..not for the wealth of knowledge..materials or preservation of ourselves. I think we must try not to waste or lose our precious time worrying about the date and time because not only is this a temptation by a malevolent being.. we will certainly deeply regret it when the time does come..God Bless everyone I do not know you.. but through God and the purity of Jesus and Mary..I Love You with my heart and I want the very best for you ..when the time comes everything will be as we want it to be and more because God hears our calls and prayers..he sees our acts and ways ..like fragrants flowers..so lets give him and one another bunches of ourselves by doing what he asks and respecting his Son in an attempt to repay him for all he continously gives to us..
Malachi Martin gave himself a timing, my Warning year will stay online, thank you. While the diplomatic staff from Rome are so committed in the syncretistic efforts of ecumenism, trying to adjust our Sacred Institution to the New World Order, those true Catholics in the East are already dealing with the aftermath of an unconsecrated Russia. Soon the trouble will get to Rome as well, they just didn’t realize yet. There is too much noise over there, the festivities of the Mercy don’t let them listen the war drums from that far. RUSSIAN CHURCH ACCUSES UKRAINIAN GREEK-CATHOLIC LEADER OF UKRAINIAN OF RUSSOPHOBIA AND HOSTILITY TO ORTHODOXY. John AU are you around? Do you have any opinion on that? Yes, I am continuing to read with much interest your posts about current developments in Eastern Europe and of their relevance to Garabandal. I am aware of the Uniate-Orthodox division and agree with you that this latest news forebodes bad times ahead: especially for our Christian brothers and sisters in that war torn country. All of these issues are to be expected given the state of the world and confusion in the Church right now. In the midst of it all, it is important that we maintain an active prayer life, remain steadfast in the faith and not be afraid. Here, I am reminded of Our Blessed Lord’s injunction; ” without Me you can do nothing”. Hello John, it is good to see you around, thank you. Somebody said that Noah has closed the Ark’s door yesterday… That’s funny, I’ve noticed that it has been raining for quite a long time but it looks like the people are enjoying to play on the mud. It’s a weird moment this one. I respect your opinion on the warning in 2018 but don’t you think that would be too late after the synod? If one of the benchmarks of the warning is that it will be after a synod, wouldn’t 3 years be too long? Once again – I insist – the Eastern Catholics and particularly the Ukrainian Greek Catholic Church is working for the Triumph of the Immaculate Heart of Mary now, in real time. Once again, the Major Archbishop of “Kiev”, head of the martyr Church of “Ukraine” unequivocally involved in the prophesied “final solution”. 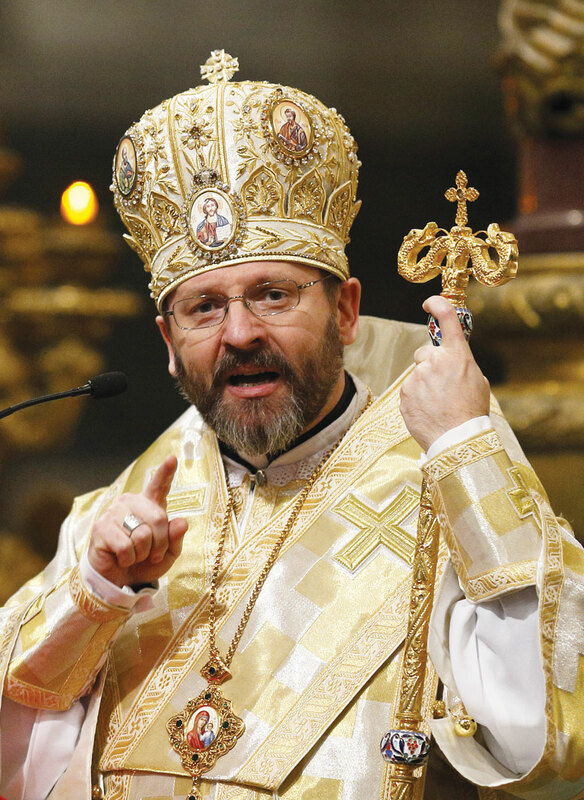 His Beatitude Sviatoslav Shevchuk went intrepid against the diabolical stream of the Synod and explained clearly why divorced and re-married cannot receive communion. Is he the one who’s driving souls into a schismatic position? I don’t think so. Because the language of God is “yes” or “no”, clear as water. Doubts and confusion are the work of Satan. I believe that if our lady wanted us to know it in advance, she would tell us that way. In fact, I believe that nobody knows exactly the dates of the Warning and Miracle. Even Conchita, in my belief, she must know the exact date of the Miracle but only in relation to another event like the Warning, or a papal trip to Russia or something else. For me, it’s hard to accept that Our Lady would let Conchita carry out such a heavy fate for 60 years or so. What about the freedom of will in her actions and in the Church’s actions? The prophecies of Garabandal, by their nature and scale, are reserved for a very singular moment in the history of the mankind and, mainly, in the history of the Church. That moment of the Churche, in my opinion, has to be as serious as the one that we are watching now, the dark moment, so I don’t think your dates are that out of context. The dates are not important anyway. What’s important now are the prayers and penance. True repentance for the sins and reparation with amend of life because that’s the only way we can get a valid confession and achieve the true God’s mercy. For the rest, as Benedict XVI once has advised us, just hold on to the doctrine. I think he meant the same old doctrine of ever and not the new diabolical doctrines in fashion at the moment. The main Portuguese TV Channel RTP was broadcasting, early this morning, a strange and scary phenomenon which happened in the atmosphere of the Atlantic Ocean during the last few hours and watched from Madeira Island. Some kind of unusual electrical storm. No modern Prophet on my blog, thank you.. Thank God you still have a fairly good sense of humour. Don’t worry I will not be hogging your site. Just paying a wee visit today. I agree Aviso. I am not with Charile’s prophesies but it was for the final address by Pope Francis to Synod. Hopefully this good forum will not end as soon as we will get the final conclusion about Medjugorje, in my opinion you still bet on the wrong horse. 1) You were wrong many times with the previous dates. Why should someone believe your new finding? Just to know. 2) I remember that once you said “if you knew the scenario I had been given, then you wouldn’t sleep until spring 2016”, without giving further details. I’ve been sleeping perfectly since you said that, but I suppose you didn’t change your idea about the next few months starting from now until Q1 2016? If then, we would really appreciate if you could share those secrets with us. 3) With a Warning in 2018, when should the Miracle occurs? I don’t change my idea, though: April 13, 2017. 3. April 13 2017 and front of your TV, in your sofa watching ET’s movie, I know so why not in 2017 but time will tell only. I thought the Miracle was to occur between the 8th and 16th of March, April or May and would coincide with a great feast day of the Church. April 13 1917 coincides with the feast of the Holy Eucharist before Easter April 16, 2017. If the Miracle does happen on April 13th, then the warning comes less than a year before that. I propose that a meaningful date would be Ash Wednesday 2017. The beginning of Lent is an appropriate time for us to start examining our consciences. From what I’ve read I think the ‘Adviso’ is a form of such an examination so Ash Wednesday would fit that action. As the month of the Miracle is generally accepted as being in April any speculation about the year of the Warning amounts to pre-empting the date of the Miracle; since both are within the same year. Where does this ‘Breaking News’ leave Conchita? Without supporting evidence, I’m doubtful. Time will tell John but I am confident, thanks. And how did you come to this conclusion so that we can assess? Why should we simply believe it is 2018? I will reply to your question Bob, as long someone is polite and respectful, I am always open to give more détails, let me start with the 101 cries of our Lady in Akita, one of the important détails I used to get my conclusion, the rest soon. Yes. Please explain how you came to this conclusion.